University of Pennsylvania Press, 9780812212402, 320pp. In The Economic Illusion Robert Kuttner sets out to refute the conventional view that a more egalitarian distribution of income and services is only achievable at the expense of a prosperous and growing capitalism. 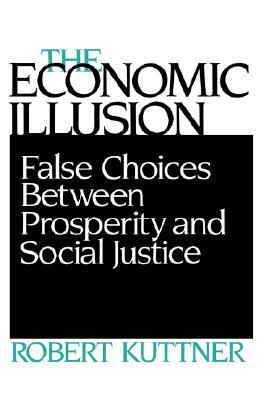 By carefully examining issues where economic growth and social justice appear to be in conflict--issues such as social security, protectionism, income taxation, and welfare--he convincingly argues that equality and economic prosperity are not mutually exclusive pursuits. As a means to reconcile equality with efficiency--i.e., prosperity--Kuttner argues for economic polices that would deemphasize private markets, for an increase in trade protection, and for an adapted version of the technical approaches of such countries as Sweden, Germany, Austria, and Japan. Kuttner concludes his arguments with the suggestion that injustice is not necessarily an economic issue and that practical social alternatives are possible. Robert Kuttner is author of The End of Laissez-Faire: National Purpose and the Global Economy After the Cold War, also available from the University of Pennsylvania Press. He is cofounder and coeditor of the political and public-policy quarterly The American Prospect.